The Pixel Buds have also dropped to $129 on Google's online store. The Pixel Buds were announced alongside the Pixel 2 and Pixel 2 XL in October of last year, and since then, we've rarely seen them discounted. Sure, there was a 50% off offer when purchased with a Pixel 2 or Pixel 2 XL, but that required you to drop at least $649 on the phone itself. 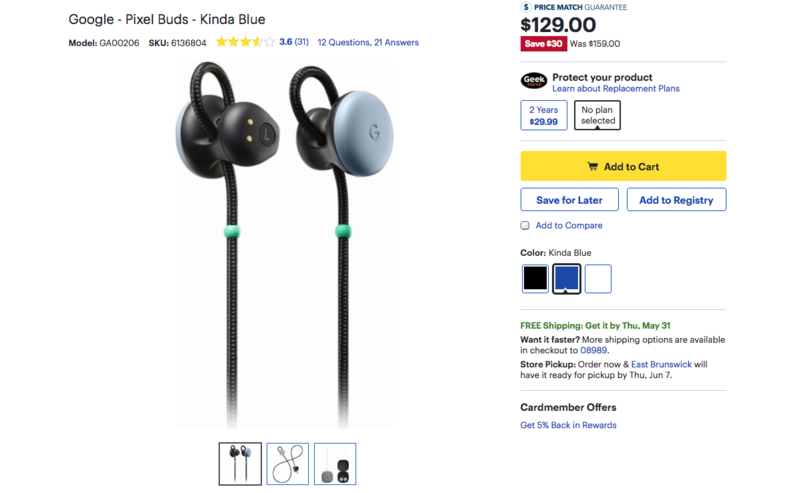 Best Buy currently has the Pixel Buds for $129, $30 off MSRP. Our review of the Pixel Buds wasn't the most positive, partially owing to the $159 price point. We liked the gestures, Assistant, and pairing, but found several other aspects a bit subpar. Best Buy's reviews section is mixed, with some very happy with their new Bluetooth earbuds and others less so. Best Buy has all three colors (Just Black, Kinda Blue, and Clearly White) in stock at that $129 price point. Shipping is free, and store pickup is available as well. Hit the source link below to grab a pair of your own.